This fourteenth edition is fully updated throughout with new images and inset text boxes to help guide students and instructors. Complete with figures, timelines and maps, this is an ideal resource for anyone wanting an accessible and comprehensive introduction to the world’s religions. Over the last few decades, the professional study of religion has fetishized difference and denied sameness. It has also chosen to focus on the local and to ignore the global. As a field, we have allergically avoided the "big picture." But not here. 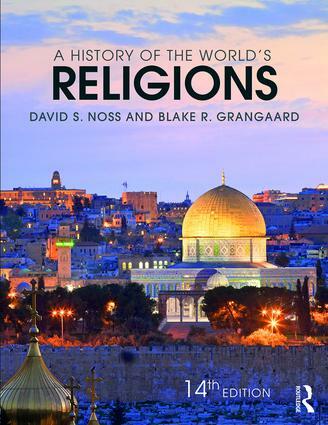 Noss and Grangaard have given us a marvelous text on precisely this big picture and this more generous view of human history. Jeffrey J. Kripal holds the J. Newton Rayzor Chair in Philosophy and Religious Thought at Rice University, USA, and is author of Comparing Religions: Coming to Terms, with Ata Anzali, Andrea R. Jain, and Erin Prophet. Having utilized many editions of A History of World Religions in undergraduate Religious Studies classes, I eagerly await each new edition. The updates, glossaries and encyclopedic information are invaluable. I won't assign any other textbook but this one! Amy Fisher,Interfaith Center, Suffolk University, USA. A History of the World's Religions is particularly valuable in that it traces the historical evolution of the world's religions. It also answers three crucial existential questions: What do adherents of each religious tradition think? What do they feel? And how do they act? I have yet to find a better resource to introduce the major world religions. Dr. Mark Etling, School for Professional Studies, Saint Louis University, USA. David S. Noss taught in the Religion and Philosophy Department of Heidelberg College from 1950 until his retirement in 1989, although he continued teaching students and advising faculty until his passing in 2010. Blake Grangaard earned his B.A. from St. Olaf College, M.Div. from Luther Theological Seminary and Ph.D. from Union Theological Seminary in Virginia. He was a pastor for almost 10 years before turning to academia. He is currently a Professor of Religion at Heidelberg University, USA.